The ACRL Literatures in English Section is working on a proposal to sponsor an ACRL publication about digital humanities and subject specialists. 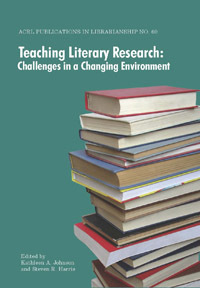 Our section has sponsored other ACRL publications, including Literature in English: A Guide for Librarians in the Digital Age edited by Betty H. Day and William A. Wortman and Teaching Literary Research: Challenges in a Changing Environment edited by Kathleen A. Johnson and Steven R. Harris. We are looking for approximately 10-15 chapters that examine the role of the librarian subject specialist in digital humanities. Digital humanities is changing the way that humanities scholars research and teach, and libraries are in a great position to help support these efforts. Subject specialists who work with humanities faculty are in a unique position because they often have good relationships with these faculty and have a strong understanding of their needs, but many subject specialists may lack the training to provide support for digital humanities work. Some subject specialists are lucky enough to work in a library that has a digital scholarship center and has staff that are specially trained to help with metadata and digital projects, but this arrangement can still create challenges for subject specialists as they figure out how to navigate between their faculty and these specialists. This book aims to examine how subject specialists are meeting these challenges and making the most of the opportunities that come their way. Examples of successful digital humanities projects. Examples of less than successful digital humanities projects. How a subject specialist trained to be a traditional bibliographer learns the skills necessary to do work in the digital humanities. Examples of how subject specialists can collaborate with/support faculty, or collaborate with IT professionals, Special Collections librarians, Digital Resources librarians, etc. Using digital humanities projects to answer reference questions. How do librarians identify, evaluate, manage, and promote digital humanities projects? How to teach undergraduates and graduate students to use and/or create digital humanities projects? Thought pieces on the role of subject specialists in digital humanities. For example, should subject specialists be involved with digital humanities, or should that work be done by digital humanities librarians? Submission Procedure: Proposal Submission Deadline is December 15th, 2013. Academic library professionals are invited to submit their proposal of not more than 2 pages. Your proposal should include: 1) the names and contact information for all authors (identify a main contact); 2) a clear description of the topic you are proposing for a potential chapter; 3) reason why this topic would be of interest to subject specialists; 4) a brief description of your academic institution; and, 5) information about the author(s) showing his/her qualifications for writing the case study/chapter. Submissions should be in Microsoft Word. Authors of accepted proposals will be notified by January 31st, 2014. If the book proposal is accepted, each chapter will be expected to be about 4,000-5,000 words. All of us are faced with new questions about collections in the massively-networked digital age. The Modern Language Association has commissioned a special batch of articles on the subject of “Evaluating Digital Scholarship,” which is freely accessible on the PMLA site. The series is introduced by Susan Schreibman, Laura Mandell, and Stephen Olsen, with contributions by Steve Anderson and Tara McPherson (‘Engaging Digital Scholarship: Thoughts on Evaluating Multimedia Scholarship’), Geoffrey Rockwell (‘Engaging Digital Scholarship: Thoughts on Evaluating Multimedia Scholarship’), Bethany Nowviskie (‘Where Credit Is Due: Preconditions for the Evaluation of Collaborative Digital Scholarship’), Jerome McGann (‘On Creating a Usable Future’), and Katheleen Fitzpatrick (‘Peer Review, Judgment, and Reading’). For the most part, these pieces are not directly addressed to the questions and concerns of library collections, but the entire conversation is highly relevant for us, and I hope we might begin some conversation here regarding that relevance. It’s fairly redundant to say we are often faced with tough choices in our collections duties, but small press publications present special challenges. New production methods (especially print-on-demand technologies), combined with trade presses’ shrinking interest in literary publications (and their low profitability margins), has led to a small press boom in recent years. It can be hard for librarians to keep up and hard, too, to sort the wheat from the chaff. I’ve just come across a nice website that might be of use (at least as part of our selection toolbox). It’s called Hey Small Press!, and it’s designed by Public Library employees for the purpose of getting good small press publication into the stacks. The Public Library focus seems more circumstantial than essential to me, and I plan to use it to help inform my small press buying. Do you have other recommendations for this kind of selection tool? I compiled and co-edited, with Irwin Streight, Ph.D., Flannery O’Connor: The Contemporary Reviews. It was published this past June by Cambridge University Press. How did you decide to write this title? I stumbled upon some of the author-specific volumes of Cambridge University Press’ American Critical Archives Series and realized that, because I had already researched and identified all the reviews of O’Connor’s books for my previous book, Flannery O’Connor: An Annotated Reference Guide to Criticism (Timberlane, 2002), it would probably be fairly easy to type, edit and proofread the reviews for an O’Connor volume. I then sent a detailed proposal/query letter to the series editor, Dr. M. Thomas Inge at Randolph-Macon College, and was pleased when he responded that he was enthusiastic about including a volume on O’Connor in the series. Then, after some back-and-forth correspondence regarding style, length of the proposed manuscript and royalty rates, he recommended the title to Cambridge University Press. I was then issued a contract and was soon writing another book. Please talk about the research and writing process. Unfortunately, once I began work on Flannery O’Connor: The Contemporary Reviews, I found that, while I enjoyed editing and typing the reviews, I had seriously underestimated the time it would take to identify and acquire the necessary permissions to include them. Time passed–one year, then two–and I began to sense that the project was “pulling me under.” It was difficult to do the scholarly work necessary to type and edit the reviews while trying to correspond with hundreds of copyright holders. I turned to my friend and fellow O’Connor scholar, Dr. Irwin Streight at the Royal Military College (Canada), and asked him to join me as a co-author. Thankfully, he agreed, and immediately started editing and writing the Introduction. Meanwhile, I gritted my teeth and turned my attention to acquiring the remaining more difficult copyright permissions, one-by-one. Indeed, I was negotiating back-and-forth with the New York Times and other corporate rights holders right up to the day we returned the marked-up final version for printing. The book was a good idea and is a valued contribution to O’Connor scholarship, but it was a tough, arduous journey to see it through to completion. What saved the project was the fact that Streight agreed to join me, did more than his fair share of writing and editing, and we both were able to tap into faculty research funds at our respective institutions to pay for the permission fees. I enjoy the sense of purpose that each writing project gives me. 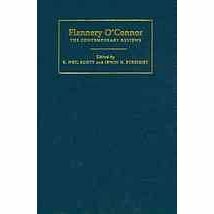 While I was writing my first book, Flannery O’Connor: An Annotated Reference Guide to Criticism, I was serving as Coordinator of Public Services, then Associate Director for Library Operations at Georgia College & State University. My days were filled with a lot of personnel-related decision-making, dealing with budgets and customer-service related issues, “putting out fires,” attending committee and other meetings, writing reports, and — if it were a good day — some public services librarianship. In contrast, my O’Connor-related reading and writing was a purposeful, peaceful and meaningful activity. And, because I often dealt with scholars working with O’Connor’s manuscripts, I knew, intimately, what the scholarly trends were, what was being written for theses, dissertations, articles and books in progress, and was able to use this knowledge to develop an intuitive feel for the essence of the criticism that I was reading and summarizing for that book. Unfortunately, with this more recent volume, even though I am in a more enjoyable position as a Professor and User Services Librarian at a mid-sized state university (25,000 students), the clerical effort required to acquire permission to reprint the reviews detracted from the writing and editing, and this book wasn’t nearly as enjoyable as my previous scholarly projects. What did you like least about the process/project? I’ve found that — to do a good job on a literary project — it’s hard to estimate when you can actually complete it. So, while going back and forth in my negotiations with scores of copyright holders I missed the first couple of agreed-upon deadlines. These situations were not well-received by the production editor at Cambridge, but I was adamant. I refused to give up and leave some of the reviews out. It became a bit stressful for all concerned, but in the end I managed to include every single review we had identified and Cambridge published a truly excellent volume. What suggestions do you have for other LES members who are interested in publishing a book? Once you identify a need that attracts your interest, send the series editor a well-written, enthusiastic query letter. Introduce yourself and impress him/her with your desire, knowledge and qualifications. If you haven’t made a record for yourself yet, just seek out someone who has and “pitch them” on the project. You’re likely to find them happy to join you as a principal or coauthor. Why are research and publication important to you? Besides the obvious requirement to conduct research and publish to meet promotion and tenure criteria, I’ve found that I enjoy the idea of contributing something meaningful to the scholarly community and to those who will come after us. I feel a satisfying sense of accomplishment to know that my books are now part of the written record of my generation; that individuals, as yet unborn, will be using them to better understand the life and writings of Flannery O’Connor and her world. The book is titled Literary Research and the Era of American Nationalism and Romanticism, part of the Scarecrow Press Literary Research Series. It was published in December of 2007. For this series, there was a post to the LES list looking for people who were interested in working on the books. I responded for more information on the series. After looking at the first book in the series and corresponding with the editors, I decided to throw my name in for consideration. For this book, I had to write a short proposal that summarized the anticipated content and organizational scheme of the book. I then had to submit a chapter outline that included representative examples of the types of resources that would be covered in each chapter. Once those submissions were approved, I received a contract, read it, signed it, and returned it to the publisher. Then, I started working on the book. I had to do a lot of research before writing the book, and I was surprised at how much I learned during this process. It was fun to explore older resources that I sometimes tend to overlook in my own research and reference interactions. There are many useful and interesting bibliographies that were compiled decades ago. These types of resources allow researchers to uncover information about authors and works that may have faded in scholarly appeal over the years. I followed the pattern established by Jenny Bowers and Peggy Keeran in their volume. They did an excellent job of speaking eloquently yet clearly to a wide variety of potential users. I tried to create a readable narrative that would connect the annotations in a logical and readable manner. Anyone who has ever created a pathfinder or research guide for a class can understand the challenge in writing annotations that don’t all sound the same. I forcibly expanded my vocabulary in order to more efficiently vary the discussion of resources. The book and the series as a whole represent a much needed tool in literary research. The book is designed to be read as a cohesive whole, but it can also be read in parts. If someone only needs information of microform collections, for example, he or she can go to that one chapter for help. My book deals with the literary output of the United States from nationhood to the threshold of the Civil War. Because literary scholarship increasingly expands its purview into cultural and historical studies, this book includes many resources that reach beyond traditional literary research tools–borrowing liberally from the standard tools belonging to other areas of scholarship. I really felt that I was learning a great deal as I researched this book. As a result, I felt pretty confident in believing that the book would be a strong addition to the milieu of literary research. I never like to read my own work. Receiving the galleys was very exciting…having to read over 200 pages of my prose was a daunting task. There is a great list of calls for papers on the University of Pennsylvania English Department’s web page at: http://cfp.english.upenn.edu/. I’ve ended up at many conferences after submitting papers to calls on this list. I’ve also written some encyclopedia articles for calls on this list. It was once am email service, but now you actually have to go to the page and look through the list. It’s also an archive, so you have to remember to check the dates for calls. I like research and writing, and I’m lucky to be at a university that supports those activities for its librarians. I like the sense that I am contributing to both literary research and to librarianship. The Publications Committee is happy to announce a new feature on the LES Blog: Conversations with LES Authors. By featuring these authors and their publications, we hope not only to bring attention to these informative works of scholarship, but also to help encourage others who may be interested in publishing to seek out opportunities and to learn from the experiences, successes, and mistakes of other section members. Authors will start the conversation with a brief introduction to themselves and their work. Afterward, members are encouraged to post comments and questions for the author by using the “comments” feature of the blog. The authors will check back weekly and respond. Our first author will be Angela Courtney. Angela is the Bibliographer for English Literatures, Film, Theatre, and Philosophy at Indiana University, Bloomington. Before moving to Indiana, she was a senior reference librarian and the university archivist at Fairfield University. Her career in libraries started at Auburn University in 1996 where she was the librarian for English literature. Check back soon for our conversation with Angela.